• Record Strikeouts In NCAA Baseball: Highest amount of strikeouts take place in past 49 years which could be caused by several factors, including flat-seam baseball. • Legendary Coach Retires: Dennis Olejniczak racks up second highest win total in high school history at Decorah H.S. in Iowa with 1,417 wins and explains his amazing system. • NCAA Div. I Recruiting Rundown: LSU lands No. 1 class for fifth time in history as Tigers bring in 7 drafted players. • Cheat Codes For Exit Velocity: Perry Husband explains in detail his system for ramping up faster bat speeds for hitters. • Q&A Session With Pat Casey: Collegiate Baseball National Coach of The Year, who recently retired at Oregon St., delves into how his teams achieved chemistry, along with other topics. • Editorial: Ejection totals shed bad light on baseball as profanity has gone wild. • Mike Epstein Column: Hitters must have adjustable swings with greatest example being Barry Bonds as he had different responses to high and low pitches with his back knee. • Superb, New Products In Baseball: Here are a number of intriguing items that coaches and players will find irresistible. • San Jose St. Placed On NCAA Probation: NCAA announces baseball program will be fined $5,000, be publicly reprimanded and have reductions in practice time both in and out of season. • Ruleball With Rich Marazzi: Catcher interference calls can cause plenty of interesting situations in game. • Dr. Dirk Baker Column: Take the time to read, reflect and improve your life. • Stu Fritz Column: 2019 ABCA Convention in Dallas, Tex. will have incredible lineup of 23 dynamic clinics with a variety of topics over three days. • Bob Smith Column: Great baseball men are passing away at alarming rate. • Book Review: New book Beyond The Ninth Inning: Tom Petroff’s Story is outstanding. • Clinics Scheduled Across USA: Here is a list of clinics, speakers and how to sign up. • High School Notes: Sabino High School stripped of 2018 Arizona title by Arizona Interscholastic Association, Guy Anderson inducted into Hall of Fame. • Q&A Session With Chip Dill: Art Arnold asks some intriguing questions as Dill uncovers treasure of data during recent Cape Cod League season. • Game Speed Practice: Hall of Fame skipper Ron Polk explains in detail how teams can dramatically improve. • Hitting With Ben Hines: ‘Animal instinct’ crucial for game’s top hitters. 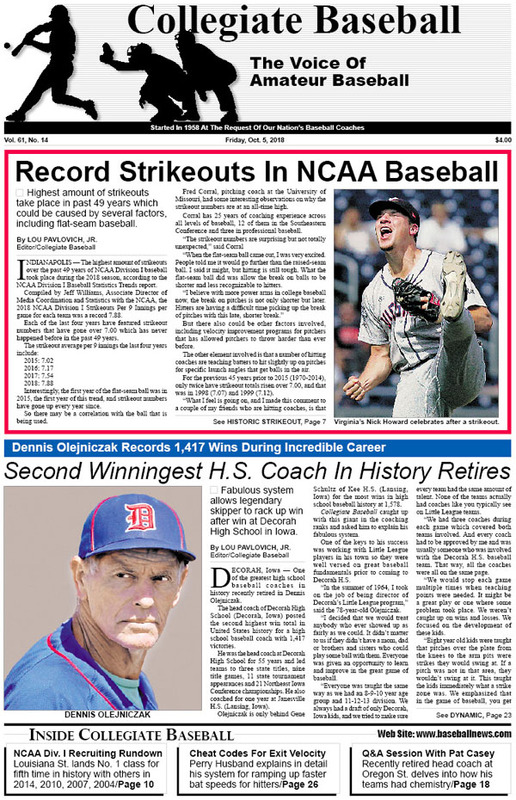 To purchase the Oct. 5, 2018 edition of Collegiate Baseball or subscribe, CLICK HERE.